As a kid, my biggest hero was my brother, Mark. Six years my senior, he was everything a little sister could want; smart, cool, and with a ton of hot surfer friends. Mostly, though, he was fearless. He would take any dare, wear any ridiculous outfit, and out-ride, jump, or last any one of his friends. My goal was to keep up. I knew if I had any chance of hanging out with him and his buddies (PLEASE GOD! Let me be friends with his surfing buddies!!) I couldn't be afraid either. I couldn't be the fraidy-cat little sister. I had to be brave. This need to keep up was, primarily, the reason I'd jump off the rock quarry into waters of unknown depth. It's why I'd bungee jump first and hand-glide no matter what my better instincts said. Beyond encouraging my own "fear habits," what my brother taught me was a more subtle, but important principle: when we are fearless, others lose their fear too. 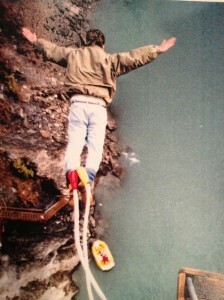 As a team leader, if I want my group to take risks, to be fearless, I realize I must model this behavior consistently. If I want people to jump in, make big decisions, take risks, I must do the same. When's the last time you've tried something (and failed) in full view of others only to try again? Do you operate out of a sense of fear or assurance? Do you take risks or hesitate and play it safe? Are you afraid others will laugh? Laugh WITH them! Are you afraid of failure? Get over it. Everyone fails sometimes. Take a leap - break the mold - decide to have fun and when you do, don't be surprised if you start a trend!